The Time of Their Lives is a British road comedy film directed and written by Roger Goldby. The film stars Joan Collins and Pauline Collins. 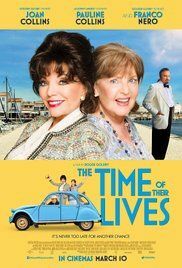 Joan Collins stars as a former Hollywood movie star who rides to her ex-husband’s funeral on the west coast of France with a best friend, played by Pauline Collins. Read more on Wikipedia.